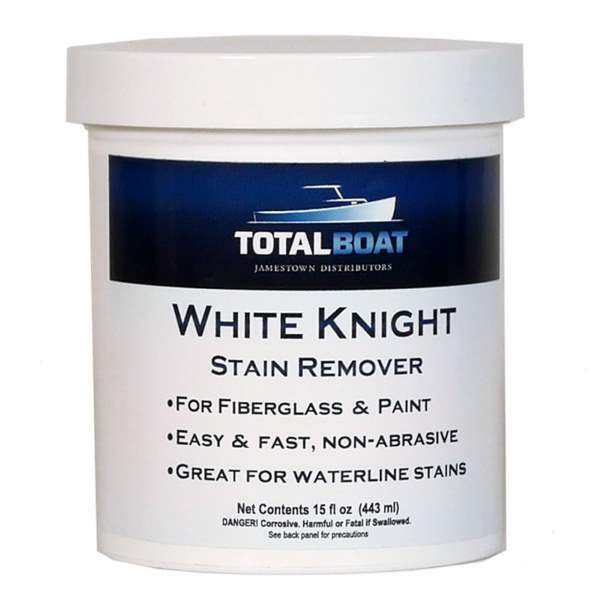 This non-abrasive stain remover eliminates tough stains on fiberglass gelcoat, and painted surfaces. Ideal for removing waterline stains caused by rust, scum, and exhaust without hard scrubbing. Wet the stained area with water before you start then simply brush a thin layer of White Knight directly on the stain and leave it there for 10-15 minutes to give it time to work. Follow up by scrubbing very lightly with a sponge or soft brush, then rinse thoroughly with water to remove White Knight so it doesn’t dry. Your arms will feel nice and rested, and you can now use all that elbow grease you didn’t have to use for stain removal to polish and protect. After removing stains with White Knight and rinsing thoroughly with water, protect the surface by applying TotalBoat Premium Boat Wax or TotalBoat Podium Finish marine polish with PTFE.